Those who enjoy wine will appreciate the style and simplicity of the Wine sack Moka, an insulated single-bottle tote with an adjustable shoulder strap. It features a stainless steel waiter-style corkscrew conveniently stored in its own secure pocket. The Wine sack Moka is made of dark brown 600D polyester canvas with complementing Moka Stripe accent trim. We can print any PMS color for no additional charge as long as it is not an exact match. 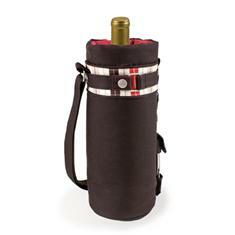 The tote is fully-insulated to keep your wine at the perfect temperature until you're ready to uncork it. A Perfect gift for any occasion.